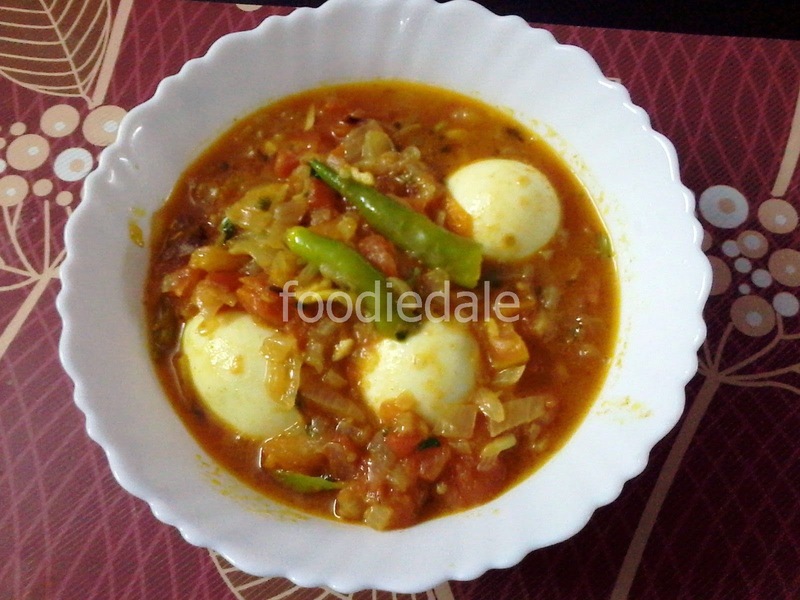 "Egg curry recipe can be made within a flick of time when our kids are hungry and needs food at no time..."
Firstly remove the shells from the boiled egg and keep it aside. Now chop the onion, garlic, ginger, tomato, green chilli and keep it aside. Now heat oil in a wok or kadai and splutter mustard seeds in it and add onion chopped. While sauting add a pinch of salt to make it tender ..meanwhile add the chopped garlicginger in it and saute well until it turn to golden brown. Now add chopped tomato and mix well . When we see that the tomato is smoothed then add all the spices mentioned above. Now fry it until it starts to leave the oil. Now add a half cup of water and allow it to cook until the gravy thickens. Now add the green chillies and boiled eggs. Simmer for 5 minutes and and remove from flame. Now garnish it with coriander leaves and serve it with chapati or rice and enjoy!! !